1 The Constitution had created a new central government for a new country. A system of "checks and balances" among three branches of government - legislative, executive, and judicial - would keep tyranny at bay. The people of America remembered all too well the British rule they had endured. They remembered why their ancestors had immigrated to this new land. A government was in place, but the rights of individuals had not been addressed. Delegates from Massachusetts and Maryland had voiced their concerns during the ratification of the Constitution. Now it was time for Congress to act. 2 James Madison was called upon to produce a list of rights. 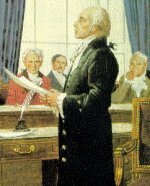 His first draft included fifteen rights, twelve of which survived the debate in the legislature. The First Congress voted to amend the Constitution on September 25, 1789. A list of twelve amendments to the Constitution was sent to the states for ratification. The first two, which applied to compensation for congressional representatives and the number of constituents they would have, were rejected. The other ten were ratified by the states, producing the Bill of Rights. 4 The First Amendment provides for freedom of religion, press, speech, and assembly; and the right to ask the government for a remedy for grievances. 5 The Second Amendment provides the freedom to bear arms.